In 1972, Richard was blinded by a rubber bullet fired at point blank range into his face. Amazingly, from childhood to the present day he has never allowed bitterness to stunt his development. “I learned to see life in a different way ... I may have lost my sight, but I have found my vision” is how he describes his remarkable acceptance of what, for most, would be a debilitating trauma. In 1996, he felt the need to harness all that he had learned and put it to the service of humanity, particularly children around the world who have been caught in the crossfire of poverty. 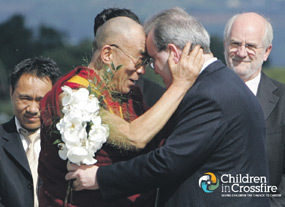 He founded Children in Crossfire, an international organisation that works to protect and promote the rights of some of the world's most vulnerable children. The story of Children in Crossfire has its roots in what began as a tragedy and ended up as a triumph of the human spirit to overcome adversity. Richard’s book ‘Can I Give Him My Eyes?’ is the inspiring autobiography of the journey he has made in his life.